Not one application is the same, therefore we have a range of clamping systems to ensure we can meet your exact requirements. There are different styles of quick release clamps suitable for use on the range of Russell Compact Sieves and the Finex 22”. Although each clamp has a specific application, they all allow for quick dis-assembly of panwork without the need for tools. These are the most commonly used on Russell check-screening sieves. This clamp is available in a number of configurations including a pharmaceutical fully stainless steel design and patent pending Russell Superclamp™, providing consistent and uniform clamping. Read more on the Russell Superclamp™. These clamps lock in the upright position and are generally used where there is limited access to the sieve, if the machine is installed in a confined area or close to a wall. This allows an operator to reach over the unit to clamp the sieve securely. Suited for high speed units, these quick release clamps provide stronger point load clamping pressure which assists in securing the sieve deck for machines operating at a higher 3000 rpm speed. 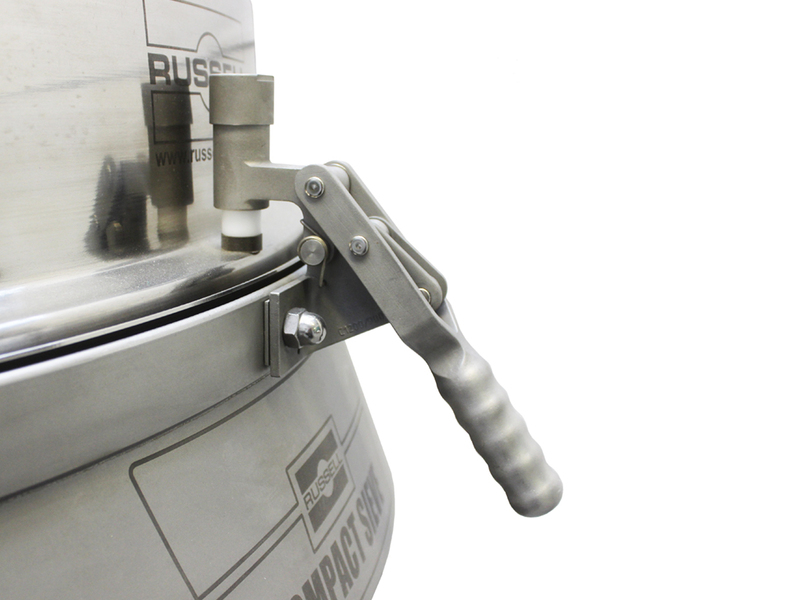 The Russell stainless steel clamps are designed specifically for the food and pharmaceutical industries and corrosive environments. They are durable and resilient giving you optimum clamping performance and are easy to clean therefore eliminating product build up. Retrofitable to all Russell Compacts and Finex 22 sieves. Band clamps are used on the Finex Separator™ and Eco Separator® units to allow for assembly of multiple sieve decks when screening more than one fraction. Our standard clamps use a two sectioned clamp secured using a nut and bolt. We also offer 2 and 3 section quick release band clamps for tool free dis-assembly. Designed for multiple deck separators, these clamps offer an alternative clamping method to the use of multiple band clamps, helping reduce the time taken to dis-assemble the sieve for cleaning or mesh screen replacement.